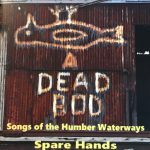 The “loose collective” of Hull-area-based singers is swift to follow up on the success of its two previous CDs with another sturdy, superbly characterful and well-sung collection of folk-heritage songs with a specific Humber connection. The hallmarks of Spare Hands’ two previous albums are present and correct here – boundless enthusiasm, gritty authenticity, robust musicianship and lusty singing, backed up by a high standard of research, all indicative of Spare Hands’ intense pride in their heritage and their respect for the past and their sources. This latest collection is honestly and accurately titled, and while its subject-matter may be drawn from a narrowly-defined geographical area, its contents certainly transcend any purely local-interest or “limited appeal” tag. This time, only a small handful of the items were familiar to me – suitably rousing accounts of The Collier Brig and Bill Meek’s brilliant ode to the steamer Lincoln Castle, and The Trip (a description of the daily routine of a Tom Pudding tugman plying the Aire & Calder, one of a sequence of three songs by Gezz Overington halfway through the CD). Otherwise, much of the easy familiarity of the songs emanates from their tunes, which in the best songmaker tradition are ‘borrowed’. In this category we find The Ballad Of Dead Bod (Botany Bay), Bury Me Down At Cape Kanin (Red River Valley) and Final Whistle (a retelling of the tale of Hull steamship SS Rialto, to Spancil Hill), while Billyboy and The Battle Of Sykehouse Lock are ‘localised’ adaptations of existing songs. All members of Spare Hands are in great voice; Mick McGarry is particularly impressive, his sensitivity of expression on songs like Final Whistle truly complements his signature rough-hewn in-yer-face delivery on the more outgoing pieces. Spare Hands’ instrumental palette (whistles, fiddle, mandolin, bouzouki, harmonica, guitar and various squeezeboxes including the streb – electronic to you and me! – melodeon) is attractive and fulsome without overegging the (Tom) pudding, so to speak. And although the lads’ able musicianship fits the songs well, the CD’s instrumental tracks are better than makeweights too. There’s a poignant, reflective moment with W.F. Sowerby’s depiction of a rather hair-raising voyage of the Humber Keel “Sobriety”, while Spare Hands’ good mate Dave Hill drops in to perform his own delectable, sprightly The Flying Lock Key (another tune based on a true boating experience), and staple session tune Midnight On The Water proves an apt and convivial coda for Goodbye, Old Humber Keel. This is an object lesson in how to produce a folk-heritage CD, with detailed booklet notes (and there’s plenty of supplementary information and full lyrics available on the group’s excellent website). Once again, all proceeds are ploughed back into the ongoing project to research and promote songs of the local heritage. 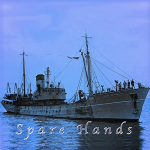 Spare Hands is the adopted “loose collective” name for a group of four singers from the Hull area that was originally convened for the specific purpose of providing recordings of local whaling songs to play in the background for visitors to the Hull Maritime Museum. Steve Gardham, Mick McGarry, Bill Sowerby and Les Ward, each being well known and highly regarded on his local patch for his contribution to the folk scene thereabouts, proved also to make a dynamic combination. A CD (Where The Whalefish Blow), many of whose songs’ sporting details having been adapted to take account of the locality, was recorded and released around the beginning of 2014, and quickly sold out. The idea for a follow-up album of songs about the local fishing industry was originally mooted as part of a Yorkshire Garland project, but, when this fell through, fortunately the group was able to fund it through sales from the first album and fees from local gigs. Here it is then: every bit as able, distinguished and listenable as the first CD, and striking a healthy balance between an almost self-picking selection of quality fishing-related songs from the local Hull heritage and reliable, lusty and heartfelt renditions of folk now-standards Three Score And Ten, Shoals Of Herring and Fiddler’s Green. These are topped up with a pair of songs from tradition that have now been blessed with Hull-themed references and adapted thus by Steve: The Dogger Bank(the tune and chorus for which originated in a New York music-hall song), and the carol I Saw Three Ships. The latter, an album standout, forms a poignant, simple memorial to those affected by the triple trawler disaster of 1968, which itself provided direct inspiration for Luckiest Sailor, one of two examples on the disc of the excellent songwriting of Hissyfit’s Linda Kelly (the other, Spare Hand, furnishing the group, and this CD, with its name). Mick’s strong, powerful singing, with its hard, lived-in character, proves just right for these songs and he also dispatches the late Mike Waterson’s Three Day Millionaire and Bye Bye Skipper with real gusto. Elsewhere, Steve takes the vocal lead on five songs, Bill on one (his own composition Through The Galley Boy’s Eyes) and new Spare Hands recruit Tom Gaynard on the MacColl number. Tom’s array of whistles provides an extra dimension to the already fulsome instrumentation (anglo concertina, melodeons, harmonica, guitar and bouzouki) and the blend is attractive, with the whole crew bringing their collective playing skills to the disc’s central track, a convivial instrumental soundtrack to Downing Pints In Rayner’s, penned by Bill. As I’ve indicated, the intense authenticity of the foursome’s vocal delivery, coupled with the evident proud involvement of all Spare Hands in the enthusiastic promotion of their local heritage (not least via the exposure of home-grown songwriting talent), makes for a worthwhile and desirable product with its own distinctive flavour.